I really do enjoy going in to a book blind – not knowing anything about what I will find on the inside. Perhaps it’s why I enjoy reviewing books as much as I do. I get the opportunity to ‘discover’ those gems that people aren’t talking about yet. But I also have to wade through a fair amount of muck as well. And then there are those books that I just don’t quite know what to make of them. This is one of those latter types of books. After running through the cover gallery (always interesting, but I prefer to see them AFTER I’ve read the story) we start our story in London’s East End in 2014 with a Muslim female detective and the discovery of a mutilated body. We then go to London, 1890, and the Whitechapel (Jack the Ripper) Murders are of concern. Investigators discover a new body, this time male (meaning it’s unlikely the work of the Ripper), and it’s quite mutilated. Those in the story wouldn’t know this, but we the readers do … these two bodies, from 1890 and 2014, are the same body. Two more trips, one to London, 2050, and to London during the War, 1940, and we have two more instances of the same dead body. It takes a little bit of time to establish all these characters and to set up this most interesting plot, but after the second appearance of ‘the body’ I really wanted to keep reading to see where this story was going to take us. But just shortly after I was praising the creators for such an innovative hook, I began to feel that the hook was going on too long. The story was clearly about this body, but once that was established we spent too much time on the sub-plots, almost hitting the reader over the head with themes of homosexuality, religion, and race. I actually lost interest in the story. The characters themselves were only moderately interesting. It was what they were dealing with (the body, and, yes, the other things going on in their lives [sub-plots]) that was what I wanted to follow. And then the end comes around and the story from 205 becomes the most interesting, while the 1890 is a complete mess, the 2014 seems fine, and the 1940 ending is something out of the Twilight Zone. The cohesion, the synchronicity that tied the four stories together was completely wiped away and I was left more baffled than when I started. Everyone seems to have had a happy ending, but in a book that is this dark, is that really possible? The art varies, depending on which story is being told. The 1890 story and the 2050 story have a more stylized art – the former dark and angular and the latter bright, simple and with almost no shading. The 1940 and 2014 stories tend to have a more ‘realistic’ look. I appreciated the way the stories looked different, but can’t say that I was particularly taken with any of the art. It was serviceable. I wanted to like this book. I thought I would like this book as I began, but it left me very cold. Looking for a good book? 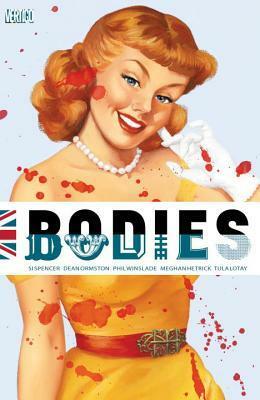 The graphic novel, Bodies, shows promise early but fails to hold the level of interest that it begins with.